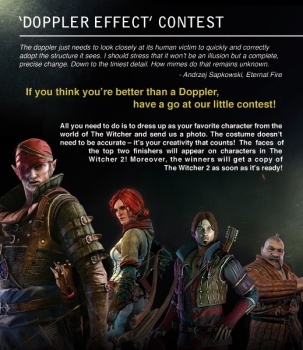 CD Projekt wants to rip your face off - and, if you happen to win the "Doppler Effect" Halloween photo contest, use it on characters in The Witcher 2. Want a shot at instant fame and maybe an opportunity to get drunk, start fights and treat women like furniture in a dark and gritty fantasy world that's actually dark and gritty? Then you, my friend, need to check out CD Projekt's "Doppler Effect Contest," a quick and easy way to put yourself in the upcoming RPG epic The Witcher 2: Assassins of Kings. The rules are simple: Dress up as a Witcher-inspired character, take a photo and send it in. Two winners will get free copies of The Witcher 2 and, even better, will have their faces used for characters in the game. More good news: You don't have to live in the U.S. to enter! The contest is open to anyone 18 years of age or older. You might be wondering about the name of the contest, since the Doppler effect is actually a term that describes how a sound wave changes for an observer moving relative to the source of the wave. What does that have to do with The Witcher? Nothing, actually. I suspect that what they were going for was "doppelganger," a typically evil but otherwise identical double of another person and a term that makes a lot more sense in the context of the game and the contest. But hey, we won't hold it against them. More information, including the full rules and a link to submit your photos, is available at The Witcher Facebook page. The Witcher 2: Assassins of Kings is slated for release in the first quarter of 2011, exclusively for the PC.